and a devoted Grandfather and Great Grandfather. 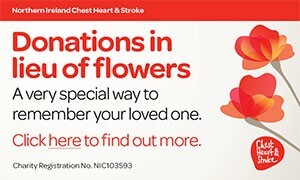 Family flowers only please donations in lieu if desired for CD Ministry in The Temple Presbyterian Church and Community Nursing Services with cheques payable to K G Cheevers and Son, Funeral Directors, 28 Dobbin Street, Armagh, BT61 7QQ. I am sorry to tell you that Andy BOYD has passed away.